At Eye Site, we are passionate about eyes! Our team are committed to delivering only the best when it comes to eye health, eye care and eye wear. Independently owned and operated, we offer the highest standard of professional and personalised eyecare when it comes to tailor-made visual solutions for you and your family. You can now reorder your prescription contact lenses online and pick them up instore. Click here to view our product range for online contact lenses. Behavioural Optometry expands to focus on more than just eye tests, taking a holistic approach to vision, including issues with the processing of visual data by the brain. Orthokeratology (Ortho-K), is a contact lens worn at night which reshapes the front of the eye (cornea) to provide clear vision during the day without wearing glasses or contact lenses. Would you like to slow down or stop your short-sightedness getting worse? Numerous evidence based studies have shown this is possible for some people. Are you fed up with wearing glasses or contact lenses throughout the day? 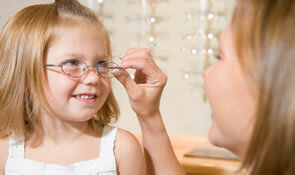 Are you worried about your child’s vision getting worse? You may want to consider Orthokeratology. Orthokeratology (Ortho-K for short), is a contact lens that is worn at night. This advanced contact lens reshapes the front of the eye (cornea) to provide clear vision during the day without wearing glasses or contact lenses. Using this vision shaping technique, properly selected patients can go through the day wearing no correction and enjoy excellent visual acuity. There are also studies which show Ortho-K can slow down the progression of myopia (short-sightedness). Ortho-K lenses are a bit like braces for teeth. 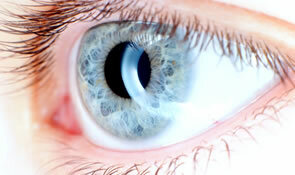 They are hard contact lenses that are worn while sleeping to flatten the front of the eye. As the eye is flattened, it corrects your prescription whilst you are sleeping. This allows better vision during the day without the need for contact lenses or glasses. 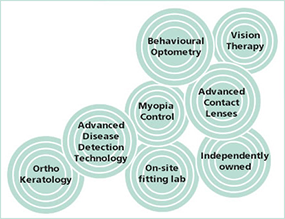 Our Optometrist will design a contact lens based on special maps of your eye. These contact lenses will allow changes to occur at night whilst you sleep so you can achieve clear and focused vision during the day. When the lens is removed in the morning the cornea begins to return to its original shape but so slowly that good vision is maintained all waking hours. Each night the process is repeated although some find they only need to wear their moulds every other night. The elastic tissue of the eye is not harmed by this daily process. Ortho-K is reversible. It is not a permanent alteration of eye tissue and thus is an excellent Laser surgery alternative for those reluctant or unable to undergo a surgical alteration of their corneas.